This is the second time for me to visit Baguio City. I visited Baguio when I was a middle school student, so I was better than other students in preparing what to bring. Many students prepared summer clothes since they think, “It’s the Philippines”. But then, the weather of Baguio City is similar to the fall weather of Korea due to its higher location. Because of that, I have friends who regretted that they didn’t bring long sleeve clothes. I was very proud of myself that I brought many long sleeve shirts because I already experienced the cold Baguio weather before. I recommend for you to prepare long sleeve clothes like hoodies and cardigans if you are planning to study here. The temperature in December becomes colder that some people even wear padded jackets. Actually, Monol’s pick-up bus is also very cold because of air conditioning so it’s also wise to bring 1~2 blankets. A lot of clothes could be a burden that is why it is better to bring a few clothes for you to wear periodically. I planned 12 weeks of studying in Monol. For this, I brought with me 1 long sleeve polo shirt, 3 long sleeve t-shirts, 2 jerseys, 2 hoodie jackets, and 1 cardigan. My luggage didn’t weigh much, I think. I’m the kind of person who likes clothes and it may seem like I brought a lot. But I think it’s not too much for me, having tried my best to meet the minimum luggage allowance. I took Jeju Airlines and the minimum luggage weight is 15kg. I didn’t pay for extra baggage. Don’t worry. Monol provides clothes hangers for students. I brought a carry-on carrier as well. 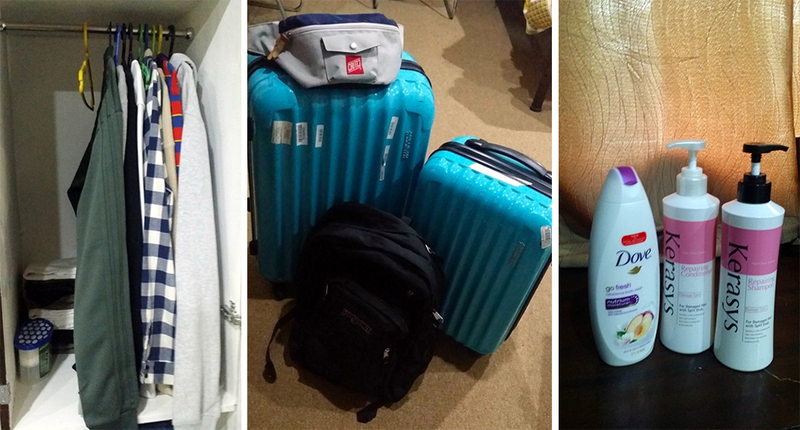 I put heavy clothes like long sleeve shirt inside my carry-on carrier and put the short sleeve shirts and cosmetics inside my luggage. Short sleeve shirts are light and there is no need to bring many things. I brought with me 4 pairs of long pants and 5 pairs of short pants. I think it would be better to bring more long pants than short pants because it’s the rainy season now. But there are many students wearing short pants here and many students wear sportswear for their comfort. Actually, comfort is really helpful for studying. If you have any plans to travel, it would be better to prepare clothes for that as well. Moreover, it would be nice to prepare slippers and running shoes, a backpack, eco-bag, sling bag and belt bag for going out on an ordinary day. To decrease the weight of my luggage, I didn’t bring too many cosmetics. I brought an adaptor along with the other necessities but the power outlets of the school are the same with Korea. Now I can use the outlets without it. Cosmetics vary per individual, but the basic ones to bring our skin lotion and sunblock. You don’t need to bring toiletries like shampoo, conditioner, and toothpaste, because you can purchase them here. I bought these things here. There are also a lot of Korean products. Actually, the famous brands are kind of expensive. The same can be said with Korean brands. These are the brands I bought. See the picture below. If you use eyeglasses or contact lenses, it is better to prepare extras because these are expensive here. That said I brought many contact lenses and 2 eyeglasses. 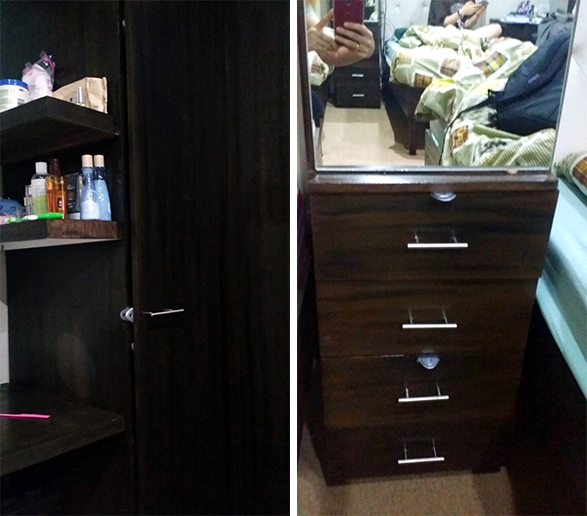 Monol’s dormitory has individual closets and you can use a lock with it. You should better bring with you 1 or 2 locks because it is important to keep our belongings secure. Also, I plan to buy one lock the next time I go to the shopping mall. Monol meals are kind of good, I think. They are nice and are above my expectation. The taste feels like I’m in Korea, it’s amazing… I think Monol’s meals are the best so you don’t need to worry about it. Water dispensers are located on every floor of the school building, too! Cup noodles and ramyeon are also available in supermarkets so I did not bring any of those. It rains a lot nowadays in the Philippines. Fortunately, we arrived here after a typhoon has already passed. However, it keeps on raining. Just prepare a strong umbrella instead of a raincoat. Be informed that you need to bring photos (5cmx5cm) for your SSP. You can also have your photo taken in the Philippines, and you also buy notebooks and pens here. I think I wrote about a lot of things here. I hope my word can be helpful to others who are preparing to come to the Philippines. Don’t forget one from these items you should bring!